All I can say is I'm so excited that The Soulkeepers Series is continuing! Lucky me, I get to read it now, but you guys have to wait until March. In the meantime, take a gander at the hottie on the cover! I'll happily look at that forever! You can read all about it below. Dane Michaels has been to Hell and back and isn't interested in repeating the experience. But as a human caught up in the Soulkeeper's world, his life isn't exactly his own. No one can explain why Dane was allowed through the gates of Eden, but it's changed everything. Now, the only one who can make him feel safe is Ethan, the telekinetic Soulkeeper with a dark past and a heart of gold. The Cover: Adam Bedore of Anjin Design creates all of the covers for The Soulkeepers Series. 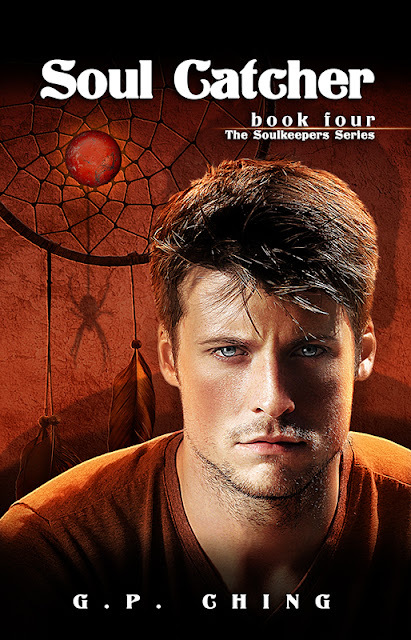 Book four revolves around Dane, pictured here, and introduces Cheveyo, a Hopi indian boy and the last Soulkeeper on the list Dr. Silva conjured in book 3. Cheveyo is represented by the dream catcher and adobe wall behind Dane. Fate, also known as Fatima, plays a role in the story. You can see her shadow hanging from the red stone in the dream catcher. (Yes, she is represented as a spider. She is a master weaver after all!) And if you think there is something up with that shadow behind Dane, you are not mistaken. There's more to him than meets the eye. Soul Catcher is slated for a March release and is the fourth book in the bestselling Soulkeepers series. G.P. Ching is the author of The Soulkeepers Series, The Grounded Trilogy, and a variety of short fiction. She specializes in cross-genre paranormal stories, loves old cemeteries, and enjoys a good ghost tour. She lives in central Illinois with her husband, two children, a brittany spaniel named Riptide Jack and a very demanding guinea pig. New! 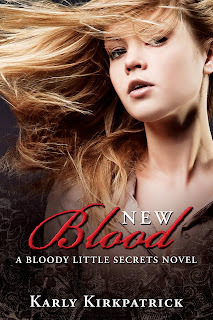 First Chapter of New Blood, the Bloody Little Secrets Sequel!!! I know readers have been at me for a while to start the sequel to Bloody Little Secrets. Well, I've gone and done it! And thanks for being so patient! As a gift to you, dear readers, I'm putting the first chapter up to help tide you over. I'm about 5,000 words in...hoping to add that many words per week. If one of you would like to come and do my day job, that would help greatly! I'm hoping to have it ready for you late spring, maybe April or May. That should allow me enough time to do it right! Mind you, no one has seen this first chapter, not even my beta readers, so it's completely fresh (meaning please excuse any errors)! “It’s happened again, Vicky.” Aunt Sue tossed the newspaper toward me. I stretched my arms above my head and yawned. I tried to ignore her scent. It was distracting. And not even remotely appetizing, thank god. I pushed the mental cobwebs away and the scent of broccoli with it. Aunt Sue had no idea, but her new vegan diet had made her safer than she could have ever imagined. I guess that was something my boyfriend Drake and I could add to the list of new information about our kind. Vampires would only eat vegans in an emergency. Dirty sweat socks would smell more enticing than Aunt Sue did right now. I slid into the chair across from her in the sunny kitchen. Ah, yes, another thing about us, we had no issues with sunlight. I picked up the paper. Gruesome Discovery at Bartlett Town Hall: Mayor Murdered blazed across the front page. My eyes roved the picture of confused police officers on the hall’s front steps. I so didn’t need this right now. “How many is that now?” I asked, even though I knew the answer. I had been following it more closely than she could possibly know. I dropped the paper and picked up the comics. I poured coffee from a carafe on the table into a mug Aunt Sue had left for me. The steam and scent that rose from the mug really had no effect on my ability to feel more awake. That was contained in the bags of blood in the locked mini-fridge in my room upstairs. I’d have to make a visit after my so-called breakfast. “Yeah, weird, right?” I looked past Aunt Sue and through the glass back door out into the back yard. The sun glittered like diamonds on the piles of snow, not unlike my, Drake’s, and Monty’s eyes did now that we were vampires. It still struck me as odd that regular humans just let it go. Like if they saw something enough, their minds just trusted that it was supposed to be that way. I still couldn’t believe that the humans in Bartlett had unknowingly let a killer like me live right among them. My name is Vicky Hernandez. Or was Vicky. I still went by it, though. I showed up in town six weeks ago, just after Halloween, or just after I had clawed my way out of the earth. I was a vampire’s experiment gone wrong, or gone right, really. I possessed something that my creator, Steve, had tried to uncover for hundreds of years— a way to walk in the sunlight. But he had failed. I could walk in the sunlight, and those created by me could as well, but it didn’t transfer like Steve had hoped. The blood that ran through my veins was from my ancestors, The Lost Ones. The one and only Daywalkers that ever existed. Thanks to them and their human counterparts, I was pretty much indestructible, provided no one chopped off my head or shoved a stake through my heart. But with my super-strength, they’d have to use an army to take me down, which is exactly what Steve had done. Sadly for him, he was the target of my revenge. Not only was my strength something of legend, my desire to get even and protect my friends was something he also didn’t possess. Hundreds of years of experience couldn’t teach him that. If you could have seen the look on his face when I beat him with his own arm…trust me when I say it was priceless. But that’s a story for another day. Bartlett had been pretty quiet since we dispatched Steve and his crew. The ‘animal’ attacks had stopped and everything was back to normal, until last week. Now some crazy was dropping mangled bodies all around town. And for what? The police had no clue. The victims didn’t appear to be related. There had been no attempt to hide the bodies. They were put on public display, like the killer got some grotesque satisfaction from showing off his handiwork. I had tried to let the police do their job, but it was clear they needed some help. The dead bodies kept coming. So who better to try and help them than a deadly killer? A creature of the night. I figure it takes one to know one, right? I only had a few bodies under my belt. Two I regretted. The others I didn’t because they were killers like me. Steve and his friends deserved everything they got. “What do you have planned for today? Christmas shopping?” Aunt Sue poured some more coffee for herself and spooned in some sugar. The spoon clinked on the side of the mug. I rolled my eyes. “Yeah, I guess I do need to go shopping. I do have a few gifts to get.” Ugh. This Christmas thing was getting out of hand. I still didn’t have much in the way of money. I’d started working at Lou’s, the pizza place where Drake and I had met before he became like me. But my next paycheck wasn’t coming for another week. I’d be one of those people who power-shop on Christmas Eve. “Please be careful out there, Vicky.” She met my eyes, her brows furrowed with concern. “I really worry about you kids right now. I mean, what if this killer comes after one of you? Maybe you should just stay here.” She raised her quaking mug to her lips. She might want to add something a little stronger to that coffee to calm her nerves a bit. Maybe she could use a nice bottle of Bailey’s for Christmas. I tried to swallow a laugh at the idea, but of course it was unfair. She had no idea that I wasn’t really her niece. I had used my vampire powers of compulsion to convince her that I was so I had a place to stay in Bartlett, to stay near Drake. And so I could try to have a normal life, or as normal of a life as I could manage like this. I couldn’t end up much more dead than I already was. 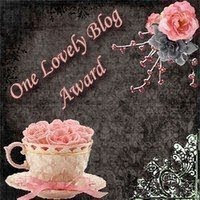 Join Adventures in Epublishing on #Shindig Tonight! Ever thought about publishing your own ebook? Come chat with me and Megg Jensen tonight. We'll give you a nice checklist to get your project off and running. Join us on Shindig, a new place for interactive conferences. This will be our first time working with Shindig, so it should be a cool experience! Here are the details and the links. You don't need to RSVP to join in, but they'll send you a reminder if you do. Otherwise just jump in tonight at 7 PM EST, 6 CST. We'll be chatting for about an hour.